Come see the smash hit Jerry Seinfeld at Caesar's Palace Las Vegas! This is one comedian show you won't want to miss. 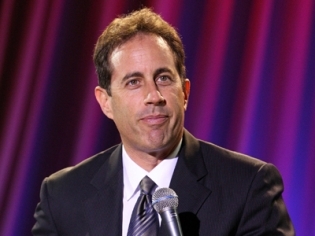 Jerry Seinfeld is one of the most hilarious, successful comedians of our time. Don't miss your chance to see him live in Vegas! Entertainer extraordinaire Jerry Seinfeld brings his hit stand-up act to Vegas for a limited number of shows. Best known for his TV series, Seinfeld, he brings his unique brand of observational humor to the stage at the Colosseum at Caesars Palace. Jerry Seinfeld takes the stage at the Colosseum to sold-out audiences to talk about “nothing.” His stand-up routine, which led him to the success of the hit series Seinfeld, will keep you laughing about the quirky way he sees things that happen everyday. Jerry’s unique status as one of the “kings of comedy” makes this show one of the most sought-after in Vegas. If you enjoy the humor of the comedy TV hit Seinfeld you will enjoy this stand-up version of the same type of humor. Taking classic situations and running with a theme, Seinfeld can find hilarity in almost every situation. Tickle your funny bone at these performances while learning about Jerry’s post-Seinfeld life including marriage, kids and cars. Performing only on select dates at the Colosseum, be sure to buy your tickets ahead of time if you plan a trip to Vegas. Jerry is a class act. We laughed the entire time. His humor was great and also pretty clean. We would see him again. Seeing him is worth the money! That is all I even need to say! This is Jerry Seinfeld!! HILARIOUS! Jerry is still as funny as he was on his tv show. the show is 90 minutes and we laughed and laughed. His quick humor and funny faces just add to the act. I would love to see him again next time I am in Vegas! !